Meg's Food! 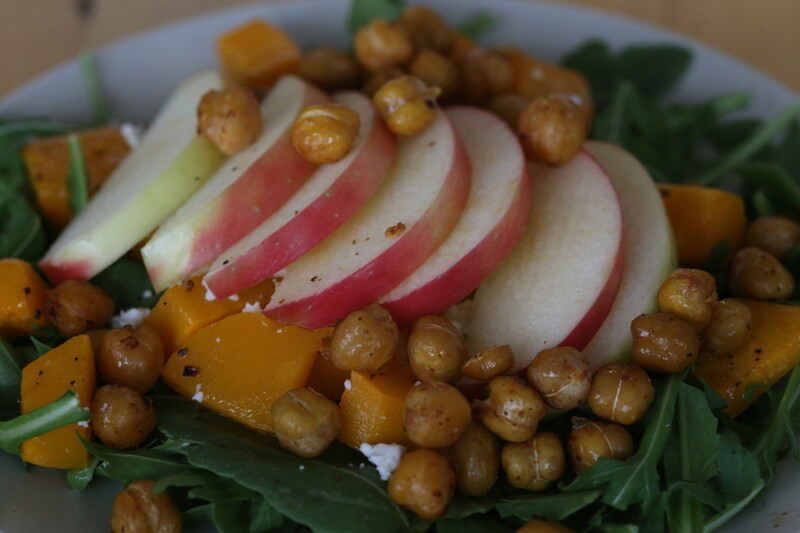 | Butternut Squash and Apple Salad - Meg's Food! Fall is such a great time of year for salads. With all the wonderful produce in season right now, you have so many options. And fall flavours are the best. Fall gives us pumpkin spice and apples and cinnamon, I mean what else do you need! 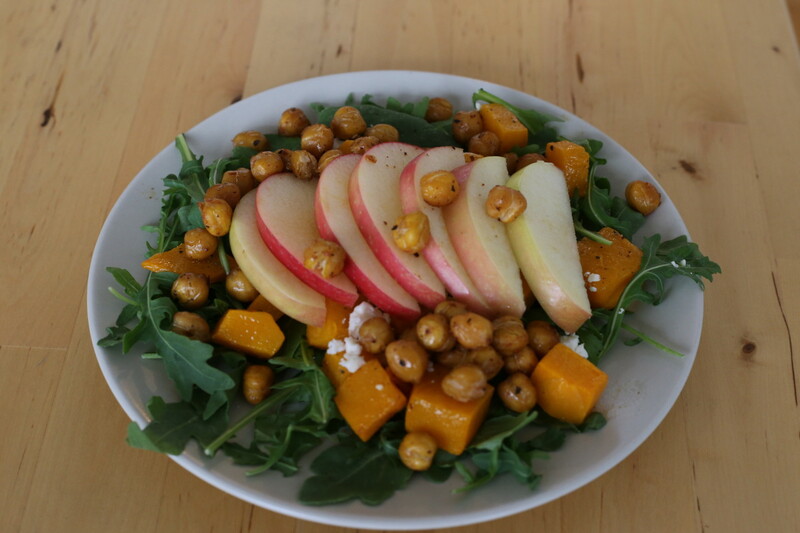 This salad really takes advantage of fall flavours and produce. Roasted butternut squash and crunchy apples go so well together. 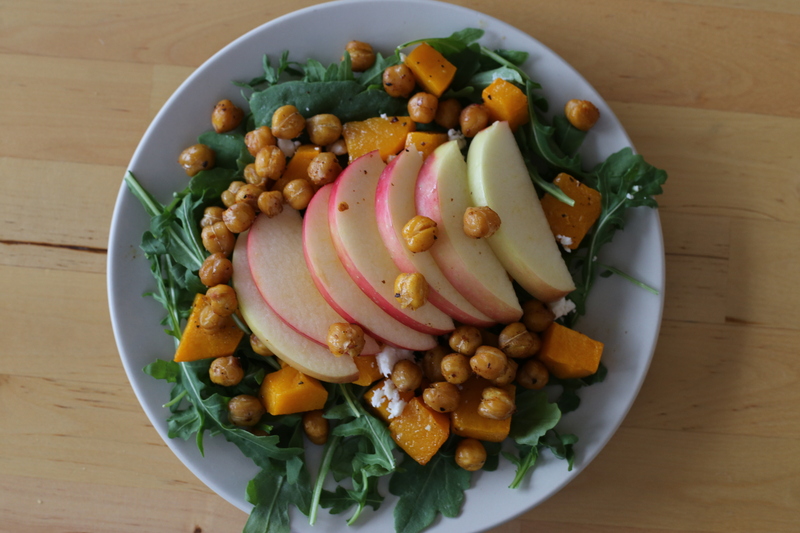 I add spicy roasted chickpeas to boost this salad into main dish territory, and throw it all together with feta, baby arugula, and a maple vinaigrette. You can make it ahead if you’re taking it to work, just keep the chickpeas and dressing separate, and cut up the apple the morning of to keep it from going brown. Preheat oven to 400 and line two baking sheets with parchment paper. Peel butternut squash, scoop out seeds, and cut into cubes. Toss with olive oil, season with salt and pepper, and roast until soft, about 25 minutes, tossing halfway through. Drain chickpeas well and transfer to second baking sheet. Drizzle with olive oil and season with salt, pepper, chili flakes, and paprika. Roast until crispy, about 25 minutes, tossing halfway through. To make dressing, whisk together all ingredients and season with salt and pepper. Slice apples into thin slices. Toss arugula with dressing and divide among two or three plates. 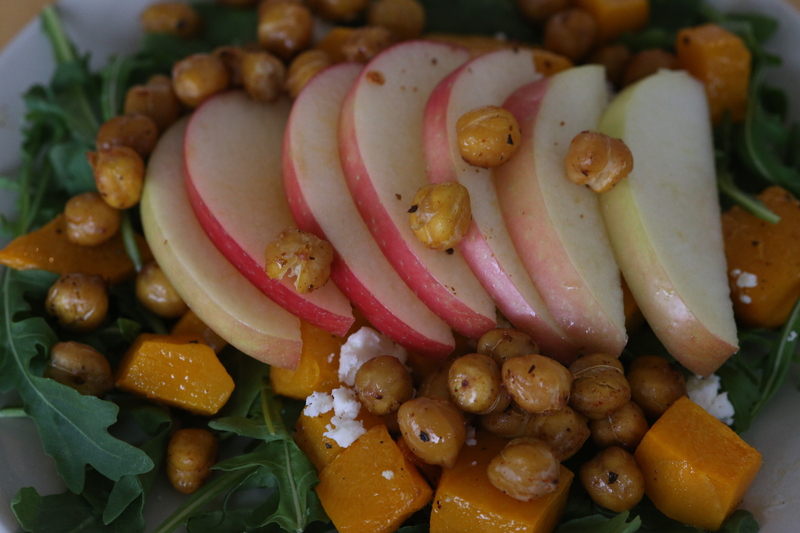 Top with chickpeas, butternut squash, and apple slices. Crumble feta over each salad. This entry was posted in Dinner, Lunch, Salad and tagged apples, chickpeas, fall, feta, october, roasted chickpeas, salad, squash. Bookmark the permalink.